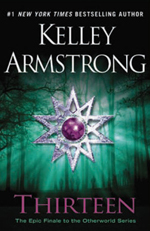 I started my love of reading with Bitten by Kelley Armstrong. Since then I've read several of her books and always look at her new ones. I'll have to read the others in the series before reading this one so I know what is going on since this is the end. I've read her Darkness Rising and Darkest Powers and loved it! I have yet to catch up with her grown up series but I love her writing style. I actually haven't read those, are they good?